Topics: Order & Pricing, Instructions, Design Benefits, Health Benefits, and Cold Weather. 30 users visit the site each day, each viewing 2.10 pages. American Registry For Internet Numbers (Virginia, Chantilly) is the location of the Apache server. 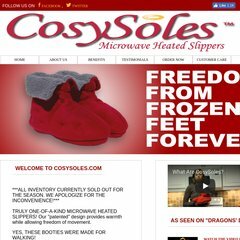 Cosysoles.ca's server IP number is 69.49.101.51. It has 2 DNS records, ns1.business.allstream.net, and ns2.business.allstream.net. A time of 26.3 ms, is recorded in a ping test.